Shawn and Gus are back to solve more mysteries. Psych is USA’s longest-running show right now but isn’t their highest rated one. How long will the TV show stay on the air is the real mystery. Psych typically airs on Wednesday nights and USA has ordered 16 episodes. The show’s cast includes James Roday, Dule Hill, Maggie Lawson, Timothy Omundson, Corbin Bernsen, and Kirsten Nelson. Below are the most recent ratings for Psych. The TV show’s ratings are typically the best way to tell if it will be cancelled or renewed for another season but the series has already been renewed for an eighth (and possibly final) season of eight episodes. Final season averages: 0.8 rating in the 18-49 demographic with 2.51 million total viewers. 0.8 demo rating (-16% change) with 2.23 million (+2% change). Season averages: 0.81 in the demo with 2.51 million. 0.7 demo rating (-13% change) with 2.18 million (-12% change). Season averages: 0.81 in the demo with 2.55 million. 0.8 demo rating (0% change) with 2.48 million (+7% change). Season averages: 0.82 in the demo with 2.58 million. 0.8 demo rating (0% change) with 2.31 million (+1% change). 0.8 demo rating (0% change) with 2.29 million (-3% change). Season averages: 0.83 in the demo with 2.61 million. 0.8 demo rating (0% change) with 2.35 million (-4% change). Season averages: 0.83 in the demo with 2.64 million. 0.8 demo rating (-11% change) with 2.46 million (-11% change). Season averages: 0.83 in the demo with 2.67 million. 0.9 demo rating (+29% change) with 2.77 million (+23% change). Season averages: 0.84 in the demo with 2.70 million. 0.7 demo rating (0% change) with 2.25 million (-7% change). Season averages: 0.83 in the demo with 2.69 million. 0.7 demo rating (-22% change) with 2.41 million (-18% change). Season averages: 0.85 in the demo with 2.76 million. 0.9 demo rating (+29% change) with 2.93 million (+20% change). Season averages: 0.88 in the demo with 2.83 million. 0.7 demo rating (-22% change) with 2.45 million (-19% change). Season averages: 0.88 in the demo with 2.81 million. 0.9 demo rating (0% change) with 3.04 million (+8% change). Season averages: 0.93 in the demo with 2.93 million. 0.9 demo rating (-10% change) with 2.81 million (-4% change). Season averages: 0.95 in the demo with 2.88 million. 1.0 rating in the 18-49 demographic with 2.94 million total viewers. Season average: 1.00 in the demo with 2.94 million. 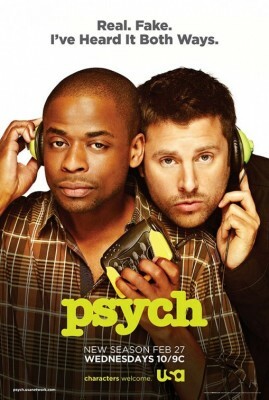 Psych’s debut was on par with the sixth season premiere. In October 2011, that episode drew a 1.0 demo rating with 3.0 million viewers. Reference point: The sixth season of Psych averaged a 1.0 rating in the 18-49 demographic with 2.75 million total viewers. What do you think? Do you still like the Psych TV series? Are you hoping that it’s renewed for a ninth season? Psych: Will Season Eight Be the Final Season? My 3 favorite shows on USA were Monk, Psych, and Royal Pains. I have no idea why Psych or Monk were cancelled. It would be great if Monk did a 2 hour movie special. The same goes for Psych. A lot of people miss these shows as much as I do. I hope you will look into the possibility of a 2nd movie for these shows. Bring it back! A lot of people love and they should put it back on now!!! Please bring it back for another season!!! Please please please renew my favorite show PSYCH!!!! !